Frankfurt's attractions are complex and wonderful. The city on the Main is one of the oldest in our country, so the sights include historic places, but also the modern highrises, hence the nickname Mainhattan. The skyscrapers are definitely the first sight when you approach Frankfurt Germany. However, visit the old quarters around the Römer town hall, and you'll feel like being transferred into a different world. It might not be love at first sight, after all, many visitors come here for business and not to admire tourist attractions. However, Frankfurt has a lot of charme, I really love it. Visit one of the incorporated suburbs, Höchst for example, and you will feel like you are in a small country town. Discover historic buildings, fascinating museums, exclusive shopping malls, superb dining and a thrilling nightlife. Frankfurt offers heaps of attractions for everyone. Most of the highlights are located in the city centre, and can be easily reached by foot. Public transport with the S-Bahn, U-Bahn and buses is pretty good as well. 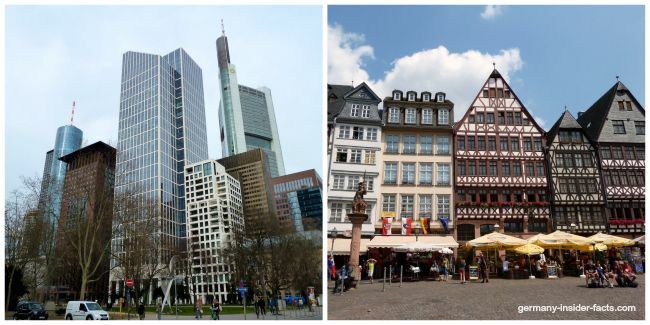 Join me on a sightseeing tour to Frankfurt Germany, the financial centre of the European mainland, the world city on the river Main in Hessen, and one of the major cities in Germany. Unfortunately, Frankfurt doesn't look its age anymore. The Old Town was almost totally destroyed by bombs during World War II. Many of the old buildings you see today around Römerberg have been reconstructed, and the work still continues. Let me give you a short introduction of the most famous Frankfurt attractions and their history. Römerberg is Frankfurt's most important, and along with the cathedral behind the beautifully reconstructed houses, the oldest place of the city. In the local Hessian dialect, Römerberg is called "Frankfurt's Gut Stubb" (good living room). It has been the place of celebrations and executions, festivals and fairs for more than 1000 years. When you visit in December, don't miss the Frankfurt Christmas market at the Römerberg. The Christmas market is so beautiful and always worth a visit. The Römer has been Frankfurt's town hall since 1405. Although many municipal office are in the building, including the registration office, visitors can access the Emporer's Hall (Kaisersaal) were kings and emporers held their coronation banquets. Portraits of all 52 emporers of the Holy Roman Empire are displayed in the Kaisersaal. The Römer's balcony has seen many famous people waving to the crowds. St. Bartholomäus Imperial Cathedral (Kaiserdom) was never the seat of a bishop. The gothic church received the title imperial cathedral since ten kings and emporers have been crowned in the cathedral between 1562 and 1792. The cathedral was built during the 14th and 15th century on the foundations of an old Salvator chapel. 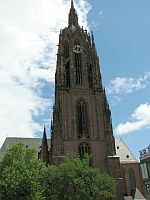 The tower (95 m) was the highest bulding in Frankfurt for more than 500 years. If you go westwards from the cathedral, towards the Römerberg, you take exactly the same route as the emperors did after their coronation (Königsweg). Just outside the church is the Archaeological Garden (Archäologischer Garten) where you can (could) see foundations of a Roman settlement and a Carolingian royal palatinate. News! Having said that, the most recent reality is that the entire area behind the Römerberg and the cathedral has turned into a huge construction lot (2012/2013). 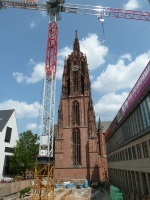 The area between the Römer and the cathedral is undergoing major reconstruction work. The aim is to reconstruct 8 historic houses, and adapt new ones to the character the quarter looked like before 1945. There will be a total of 35 new houses. In a few years visitors can explore the new old quarter that has been the "heart of Frankfurt" for centuries. St. Paul's Church (Paulskirche), Berlinerstraße, was opened as a Protestant church in 1789. Coincidence or not, this was the year of the French Revolution. During the German revolutions of 1848, citizens of the 52 german states protested for social freedom and democracy. The Paulskirche in Frankfurt became meeting place of the National Assembly (Nationalversammlung) which was in session from 18 May 1848 until 31 May 1849. Although the 1848 revolutions and the National Assembly failed, major elements of the Paulskirche Constitution became model of the Basic Constitution of the Federal Republik of Germany in 1949. Until today, the Paulskirche and Frankfurt are recognised as the cradle of democracy in Germany. Frankfurt's most famous son, Johann Wolfgang von Goethe was born here on 28th of August 1749. Goethe House was one of the first historic buildings to be reconstructed after the war. Fortunately, many interior items survived, and you can see how people lived in the 18th century. Do you want to take a virtual visit? Check out the house and rooms at the Goethe House Website. Goethe House is open daily, except Good Friday, Christmas, New Year's Eve and New Year's Day. 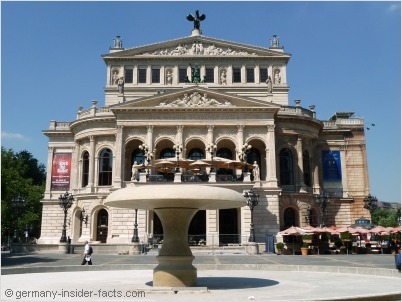 The Old Opera (Alte Oper) was opened in 1880 after a construction period of seven Years. Planed by Berlin architect Richard Lucae, the building was paid by the citizens of Frankfurt. Some important world premieres took place in the opera. In March 1944 the opera was heavily damaged during a bombing raid. Again, a citizens' initiative raised the money to reconstruct the Old Opera in the 1960s. The house was now planned and built as a concert hall. It re-opened on 28th August 1981. The highest structure in Frankfurt is the Europe Tower (337,5 m), a telecommunications tower, it's nickname is Ginnheimer Spargel. 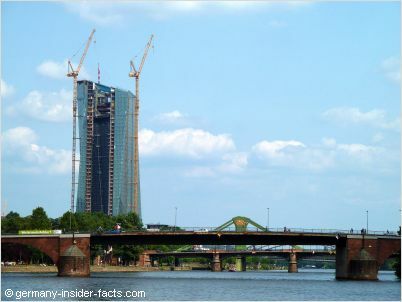 It is hard to keep track of the new buildings that appear on Frankfurt's skyline every couple of years. Below are the three tallest buildings as of 2011. The grain storage was built from 1959 to 1961. The 120 m (390 ft) Henninger Turm has (soon had) a barrel-shaped top with a viewing platform and a revolving restaurant. It was the highest building in Frankfurt until 1974 and a beloved icon which belonged to the always growing skyline of Frankfurt. 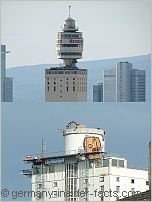 The fact that the tower is being pulled down in 2013 is a very sad affair with many locals in and around Frankfurt. It is planned to build an appartment building that should resemble the shape of the Henninger Turm. It is a good idea to stop at a tourist information centre for city maps and the latest info about events and fairs. The entrance hall of the main train station has an information centre which is open daily except Christmas (25th, 26th Dec) and New Years Day. Opening hours Monday to Friday from	8 am - 9 pm, Saturday, Sunday and public holidays from 9:00 - 18:00. The Info Centre Römer opens Monday to Friday from 9:30 am - 5:30 pm, Saturday, Sunday and public holidays	from 9:30 am - 4 pm. The centre is also closed on Christmas and New Years Day. Frankfurt offers a wide variety of accommodation for all budgets. It is always wise to book a hotel in Frankfurt in advance, especially during the numerous fairs in the city. Click the image below and check my Frankfurt hotel guide. Do you wonder what's the best way to get around in Frankfurt? Are you looking for a day tour to one of the major attractions in Germany? Below is a link to my Frankfurt tour guide. Frankfurt has worked hard to get over the Bankfurt image. The city has become a major cultural centre in the Rhine-Main area. 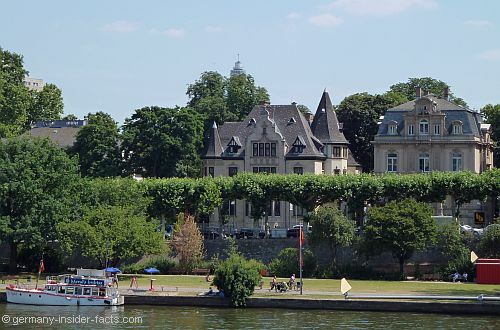 The Museumsufer (museum embankment) is south of the river Main along the Schaumainkai. The Städel Gallery displays most of the European schools of painting and is an important art gallery. Liebighouse is the museum of sculpture. Displays range from ancient Egypt & Greece to European baroque statues. The Ethnological Museum, German Film Museum, the German Architecture Museum and a few others line the Schaumainkai. A large flee market is held on the banks of the river each Saturday. The Museumsuferfest attracts millions of visitors every year in August. Museums are open to the public, music, cabaret and food stalls from many parts of the world contribute to an international flair. This is an exciting festivity celebrated on both banks of the river. Sachsenhausen is an old suburb, just across the river from the city centre and Römerberg. It is Frankfurt's apple wine (ebble woi) quarter. Schweizer Strasse is the main shopping mile with two of the well-known apple wine pubs, "Wagner" and "Zum gemalten Haus". Stroll through the old town of Sachsenhausen and you think you are in a different world. You'll find narrow cobblestone lanes, small apple wine pubs and places where the locals go and enjoy their "Stöffche", "Grie Soss" and "Handkäs". Frankfurt's Skyline is unique in Germany. No other German city has such an impressive line of high rises as Frankfurt. Main Tower (200 m) is the only building open for the public. At a level of 187 m is a restaurant and bar where you can relax and enjoy fascinating views over Frankfurt and the hills of the Taunus. The public viewing platform at 200 m is open daily, except in bad weather conditions. Don't forget your camera! There are certainly many more Frankfurt attractions like the shopping streets Zeil and Goethestrasse. Fressgass is the culinary mile with a large range of restaurants and snack bars. Frankfurt is a green city with many parks within the centre. The Zoo, Senckenberg museum and the botanical garden (Palmengarten) attract visitors and locals as well. However, take it easy when you are not used to apple wine. Especially the Rauscher, the very young, not completely fermented apple wine, could give your bowels some trouble. Ebblewoi is served in the typical ripped glasses and in grey-blue stone jars, the Bembel. 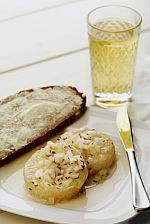 Handkäs mit Musik - Hand cheese with music is a sour milk cheese marinated in a dressing of vinegar, oil and diced onions. Sometimes the marinade has caraway seeds included, but often you get the caraway seperately and you can sprinkle them over the handkäs if you like it. What is the music? Well, the "music" develops in your tummy after you have eaten all the raw onions. Grie Soss - green sauce is a cold sauce with 7 different herbs, mayonaise or sour cream and boiled eggs, served with potatoes. It is often said that Grie Sauce was Goethe's favourite dish, however, this can't be proven. Recipes vary slightly, but the sauce must include the 7 herbs. Read more facts and get a green sauce recipe. Sauerkraut and Rippche is another traditional dish of Frankfurt. The Rippche is a cured and cooked pork cutlet which is served with Sauerkraut and mashed potatoes, or bread. And Ebblewoi, of course. This video tells you about the apple wine culture in Frankfurt and shows you the flair of the local apple wine pubs. Frankfurter Würstchen are thin pork sausages that have to be produced in Frankfurt or its suburbs, otherwise they are just sausages Frankfurter Art. The same is valid for the Frankfurter Rindswurst. The Rindswurst is shorter and thicker and made from beef. Both sausages are usually heated in hot water, don't boil them. The Frankfurter Rindswurst is also delicious when grilled. Both sausages are traditionally eaten with mustard and bread, or with potato salad.